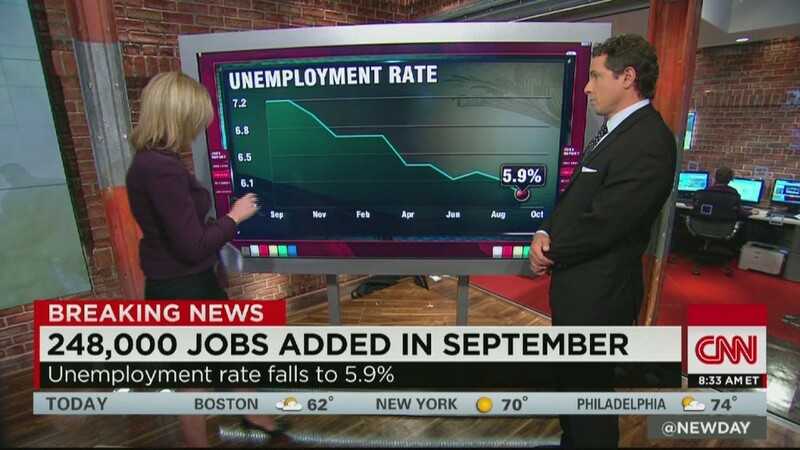 The nation's unemployment rate fell below 6% in September for the first time in six years. 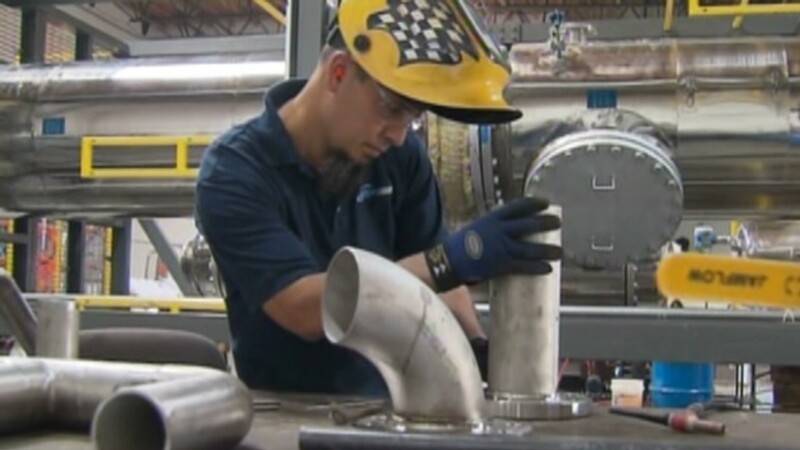 The rate came in at 5.9%, while employers added 248,000 jobs last month. The unemployment rate fell last month because more people were getting jobs, not because they were dropping out of the labor force as they have at times during the economic recovery. The share of people in the workforce was essentially unchanged. Jobs growth was strong in professional and business services, particularly in employment services and consulting. The retail and health care sectors, which have been a powerhouse throughout the recovery, also gained. Construction added 16,000 jobs. Friday's report is the final one before the mid-term elections on Nov. 4. President Obama touted the strength of the economy recovery in a speech in Chicago Thursday, though he noted that most of the gains are going to the wealthy. The president's critics, however, say the unemployment rate is declining because people are getting discourage and dropping out of the workforce entirely when they can't find jobs. The share of Americans participating in the labor force is now at its lowest point since 1978, at 62.7%. The "drop out" factor has been a problem during the recovery, but the recent decrease in the unemployment rate, which stood at 7.2% a year ago, is due more to Americans landing jobs than giving up. 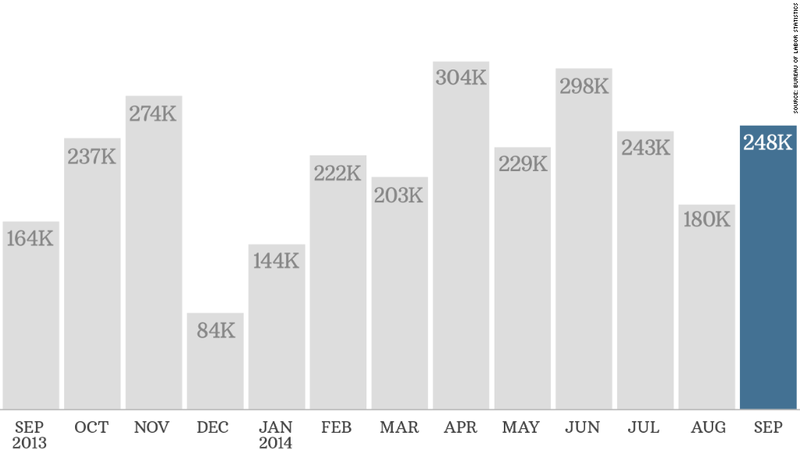 Employers have added 2.6 million people to their payrolls since last September. The recent hiring boost came after a surprisingly weak August, though the Department of Labor revised that month's figure upward to 180,000 jobs. Still, August was the first time figures came in below 200,000 since January. The August figures were affected by a strike at a New England grocery store chain. Workers there have now returned to work. The consensus forecast from economists surveyed by CNNMoney was for a jobs gain of 215,000 jobs and an unemployment rate of 6.1%. On average, the economy has been adding well over 200,000 jobs a month this year, a positive sign. This jobs report is being closely followed because economic data in recent days has been mixed. Everyone from Wall Street investors to Washington powerbrokers is trying to figure out if the U.S. is truly on solid footing or likely to slide back in its recovery like Europe has. The strong report shows that that the economy has positive momentum going into the final quarter of 2014, said Sam Bullard, senior economist at Wells Fargo Securities. "It's consistent with an economy that's broadening and strengthening," he said. A key figure to watch is whether American wages are growing. Average hourly earnings changed little last month. They are up 2% over the past 12 months, just slightly ahead of inflation, which means most U.S. workers won't feel any better off. Federal Reserve Chair Janet Yellen and other officials are closely monitoring the monthly jobs report. They are waiting for hiring to become healthy enough before raising interest rates. The continuing softness in wage growth and inflation allows the Fed to remain patient when it comes to raising interest rates, said Jim O'Sullivan, chief U.S. economist with High Frequency Economics. Americans' views on hiring are mixed, however. Gallup's U.S. Job Creation Index reached a six-year high in September, with 42% of employees surveyed saying their employer is hiring and expanding the size of its workforce. Companies are the ones adding to their payrolls, with the government sector continuing to shrink. But others say there aren't that many job openings out there, especially for positions offering decent wages. "It's still hard to find a good-paying job," said Jabari Jones, 32, a Forest Park, Ga., resident who said he was fortunate to recently land a $20 hourly job at Coca-Cola. In a CNN/ORC survey released Thursday, 57% of those polled said the nation's economy was poor.